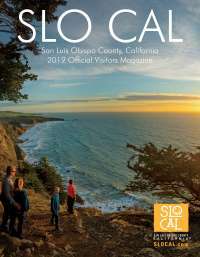 San Luis Obispo County, CA (July 1, 2015) â€“ This Fall, the California Central Coast reveals the road less savored and invites travelers to take the ultimate culinary road trip on the California Highway 1 Discovery Route. An easy-to-drive vacation boasting unexplored destinations fit for culinary lovers, adventure seekers, vinophiles, and sunshine chasers, the road trip weaves through a unique part of the Golden State, San Luis Obispo County, located half-way between both Los Angeles and San Francisco. Featuring natural attractions that most urbanites donâ€™t have the chance to experience, the route is home to 10 distinct destinations that are easy to experience by car. These fall travel hotspots remain untouched by the masses, and offer completely customizable itineraries filled with farm fresh cuisine, unparalleled wine culture, whimsical artisan towns, and seaside villages rich in character and history. A special opportunity awaits eager road trippers from September 24-27, when they can experience the best of the California Central Coast and the Highway 1 Discovery Route in one four-day foodie adventure at Volvo Presents Sunset SAVOR The Central Coast. Californiaâ€™s premier food, wine and lifestyle event, Sunset SAVOR the Central Coasts boasts celebrity and master chefs, Adventure Tours that highlight several destinations found on the Discovery Route, beer and wine tastings, Sunset Editors, special events, dinners and more. With a variety of microclimates, fall is the ideal time to embark on a road trip to the Central Coast and along the areaâ€™s 101 miles of pristine California coastline. This season, the California Highway 1 Discovery Route lifts the curtain to reveal 10 of its long-kept hidden gems. The remaining secretsâ€¦those can only be discovered by the travelers themselves. Â·Do as the locavaores do, and wander the famous Arroyo Grande Farmers Market, or as they call it in the central coast, â€œAG.â€Foodies can even join a chef-led tour for an insiderâ€™s guide to shopping, sourcing and eating local in the region. Â·[img src="file://localhost/Users/kylie/Library/Caches/TemporaryItems/msoclip/0/clip_image005.png" alt="Text Box: (Continued)" align="left" height="38" hspace="9" width="146">Take to the sea, and tour Avila Beachâ€™s natural wonders, including 300 species of native birds and over 30 species of whales and dolphins.Land lovers can view the picturesque coastline from the Avila Beach Pier, one of the few remaining piers that cars are still able to drive on. Travelers can explore Avila Beach and its wildlife by boat as part of a Sunset SAVOR â€˜s Adventure Tour series. Â·[img src="file://localhost/Users/kylie/Library/Caches/TemporaryItems/msoclip/0/clip_image006.png" alt="Text Box: SAVOR, Continued Pg. 2" align="left" height="38" hspace="9" width="146">See unique and endangered wildlife, that canâ€™t be seen anywhere else.There are not many destinations where travelers can viewmajesticClydesdales in their natural habitat and experience over 2,000 acres of endangered Monterey pines. Both treasures are tucked away in Cambria at the stunning Covell Ranch and available for exploration through Sunset SAVOR, including a wine-paired lunch. Â·Indulge in rare and sought after Abalone, at the Ocean Rose Abalone Farm in Cayucos, where sustainable aqua-farming allows visitors a unique opportunity to savor the red abalone, a mollusk with limited availability worldwide. During Sunset SAVOR, travelers get a behind-the-scenes look of the farmâ€™s remarkable facilities. Â·Meet the winemakers and owners themselves at many of Edna Valleyâ€™s distinct wineries. Unlike many wineries today, sipping at an Edna Valley winery still remains a personalized and one-on-one experience. Â·Explore tide pools with giant, fluorescent natural marine wildlifealong the Ocean Bluffs Trail in Los Osos and Baywood Park. At these unique pools, the only crowds to be found are the residentsea anemones, turban snails, rock crabs and sea stars. Â·Play a round of golf at one of Nipomoâ€™s three incredible courses. Known as a mini Pebble Beach, but with better weather, Nipomo is home to Blacklake Golf Resort, the Central Coastâ€™s only 27-hole golf course. Â·Get an adrenaline fix at the only vehicular beach in California,the Oceano Dunes State Vehicular Recreation Area (SVRA). Enjoy an impressive off-road playground of coastal dunes with an ocean view. Road trippers are encouraged to tie their Discovery Route 1 adventure in with a trip to Volvo Presents Sunset SAVOR The Central Coast. In honor, the California Highway 1 Discover Route and Sunset SAVOR The Central Coast have partnered to offer fall travelers the chance to experience the iconic route through the Ultimate SAVOR Giveaway. The winner receives an unforgettable vacation on the Highway 1 Discovery Route including VIP access to Sunset SAVOR the Central Coast events and VIP Adventure Tour activities, as well as their choice of lodging from over 500 accommodations, and dining options from over 400 outstanding restaurants. Travelers can enter to win the Ultimate SAVOR Giveaway here, or by visiting Sunset SAVOR The Central Coastâ€™s Facebook page before August 15, 2015.